The Kodak Factory was built in 1928 by Kodak (Australasia) Ltd to service the expanding photographic manufacturing business of Thomas Baker and John Rouse. ‘The building is of local architectural significance and is noteworthy for its contribution to the industrial streetscape in Southampton Crescent and also as an example of the high density industrial development characteristic of Edwardian and post Edwardian Collingwood’ (Ward 1989). 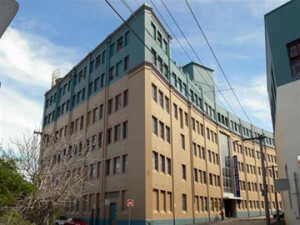 The building is a large brick building of predominantly five stories with an additional storey to Duke Street. The north facing facade to Southampton Crescent is concave to follow the curve of the street. This makes it an unusual building. There is a massive pier on the north-east corner. The building is divided into nine bays by the use of pilaster strips. The main entrance is in the central bay marked by a narrow canopy with three storeys of continuous glazing above, whilst the bays on either side of the main entrance have windows grouped in threes, with splayed sills which are stuccoed. The 1928-29 Rate Books valued the factory at 1550 pounds. The manufacture of photographic supplies began in Abbotsford in 1884 when chemist Thomas Baker set up a small cottage industry in his home Yarra Grange, which was located between the river and the site of the existing Kodak building. He was the first person in Australia to successfully manufacture and market photographic dry plates, his Special Rapid plates. This was a major advance over the inconvenient and cumbersome wet plate process. In 1887 Thomas entered into partnership with John Rouse, an accountant. Their business Baker and Rouse Australia Laboratory grew and expanded by making high quality matt and glossy bromide paper and taking over existing photographic companies. In 1905 Baker and Rouse were granted the Australia wide agency for Eastman Kodak USA products. By 1908 they had formed a partnership with George Eastman to become Australia Kodak Ltd. In 1920 the name changed to Kodak (Australasia) Pty Ltd. The factory was built to house the ever expanding business of manufacturing coated paper and film as well as the new Kodak Duplitized X-Ray Film. 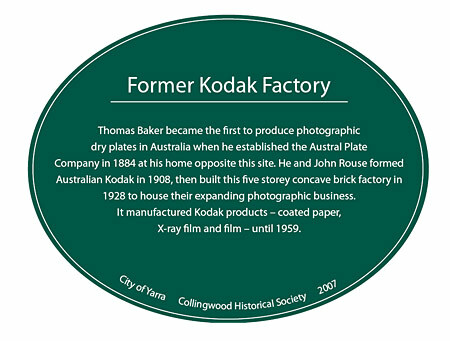 The factory continued to be used as the base for Kodak Australasia to further develop Kodak products in Australia including Kodachrome film, cameras and during the Second World War to manufacture film and paper for aerial reconnaissance, mapping and medical X-rays. In 1959 due to the continued expansion of the business Kodak Australia moved to new premises in Coburg. The former Kodak building then became part of Carlton & United Breweries and is currently the Fosters Group Abbotsford head office. Thomas Baker, his wife Alice and sister-in-law Eleanor Shaw had an interest in scientific research and philanthropy. Their greatest benefaction was to the Alfred Hospital in 1922 setting up a biochemistry department for cancer research and finding a cure for tuberculosis. Under their wills a trust was set up to underwrite the research work of the Baker Institute. Today the Baker Institute is one of the leading medical research institutes in Australia – a fitting tribute to an enterprising young chemist. Barrett, Bernard, 1971, The inner suburbs: the evolution of an industrial area, Melbourne University Press, Carlton, Vic. Kodak (Australasia) Pty. Ltd., 1985, Milestones in the history of Kodak (Australasia)Pty .Ltd., Kodak Corporate Publication, Coburg. Ward, Andrew, 1989 Collingwood Conservation Study.